Did you know one of the leading causes of industrial fires is the improper storage and handling of flammable liquids and chemicals? Storing flammable chemicals in approved chemical storage cabinets, also known as safety cabinets, reduces the risk of fire and protects your workplace. Before implementing any chemical storage plan, compile a chemical inventory. Check the Safety Data Sheet (SDS) for each chemical to understand its properties. The flash point and boiling point reveal how flammable it is. Compare this information with standards like NFPA 30 and OSHA 29. These standards classify chemicals into different flammable classes or categories. Why Use a Chemical Storage Cabinet? OSHA 29 permits storing small volumes of flammable liquids outside of chemical storage cabinets. However, these volumes are usually too low for the daily use of most industries. Using safety storage cabinets increases the maximum allowable quantities of flammable and combustible chemicals within control areas. Actual volume limits are dependent on the flash point and boiling point of the product. Chemical storage cabinets provide controlled access of hazardous chemicals. They enable segregation of non-compatible chemicals. And improved security features, such as Justrite's U-Loc™ padlockable handle, prevent unauthorized access. 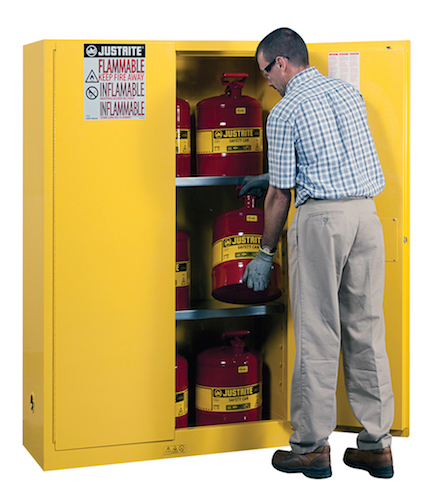 Using safety storage cabinets promotes awareness of flammable chemicals among employees. High-visibility cabinet colors allows easy identification of the cabinet's contents. Reflective labeling such as Justrite Haz-Alert™ labels provide visible warnings of dangerous chemicals, even through the smoke of a fire. With more than 300 models ranging in capacities from 4- to 115-gallons (15- to 435-liters), you can rest assured of getting a Justrite safety cabinet that meets your specific chemical storage needs. Sure-Grip® EX Safety Cabinets feature a double-wall steel structure with an air space for fire resistance. Leak-proof bottom sumps contain drips and spills within the cabinet, while the patented SpillSlope® shelf design directs spills backwards towards the sump. Do you have limited space for storing flammable chemicals? Slimline safety cabinets are taller and narrower for tight spaces. Countertop safety cabinets store often-used chemicals at a workstation or on a workbench for easy access. Under-counter safety cabinets have a recessed toe-kick that mounts flush with other cabinetry, allowing users to stand right next to the work surface. Justrite safety cabinets with self-closing doors provide the highest level of protection. They have fusible links that melt at a temperature of 165 F (74 C). If the cabinet doors are accidentally left open in a fire, the links melt. Patented self-indexing doors then automatically close in sequence to guarantee the flammable chemicals are contained. Justrite chemical storage cabinets help companies comply with regulations and keep employees safe. See all our chemical storage cabinets.